Acai berry is a small purple fruit native to the South American Amazon. Green Origins Acai is typically wild-harvested by cooperatives, like the indigenous community of Porvenir. Community-owned projects create incentives to protect forests - by providing an income and an alternative to work in timber production. Acai berries are hand-picked, cleaned and de-stoned. The fruit is pureed and freeze dried, to minimise nutrient loss. 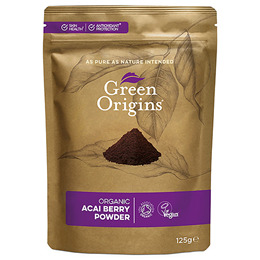 It takes over 20kg of acai berry fruit to make 1kg of Green Origins acai berry powder. Acai is a source of Magnesium, which contributes to the maintenance of strong bones and teeth and also supports mental health. 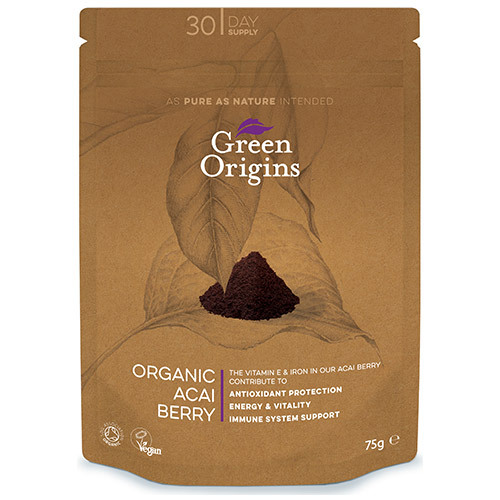 Below are reviews of Green Origins Organic Acai Berry Powder - 75g by bodykind customers. If you have tried this product we'd love to hear what you think so please leave a review.